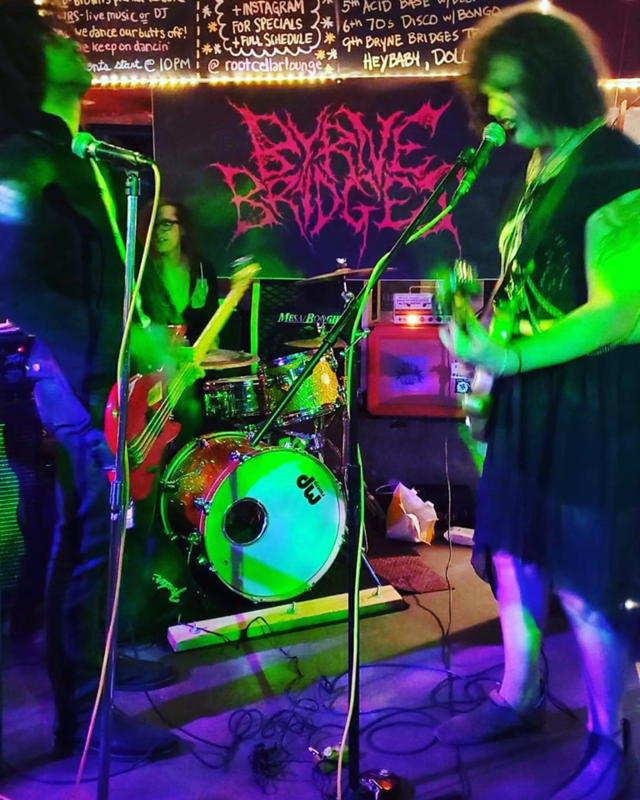 Bloomington, Indiana’s Byrne Bridges brings their “raw power-pop through a queer/trans/radical perspective” to Super Wimpy HQ in North Philly on Saturday, April 27, along with Coping Skills, Noera and Alenni. They are involved in three active bands, including the eponymous trio. Listening to their tracks on Bandcamp, one can feel the energy that goes into — and spills out of — these short-but-mighty gems. I asked Byrne about their projects, and a few other quick-take questions. What would you say are the differences and similarities among your different musical projects (Byrne Bridges solo, Wintermute and Ghastly, Indiana)? That’s an interesting question to me because I come from a community where all musicians are involved in quite a few projects. I’d say in that community I’m like medium level in terms of number of simultaneously juggled roles. I do a lot of one-off projects or jams for fun, but my two long term projects are as drummer for Wintermute and a singer/guitarist/song-writer for Ghastly, Indiana. Biggest difference between Ghastly and my solo stuff is that writing is a collaborative process between me and a partner for Ghastly, whereas solo stuff is mostly just me in my basement writing on an unplugged electric. The outcome there tends to be a little more fast and raw than most Ghastly songs. What can people expect from a Byrne Bridges show? I don’t really know, because I’ve never seen one! Leslie from Haybaby says to “expect a visceral wall of satisfying punk, listen more closely for heartcrushing, confessional lyrics. You can have lunch with any musician, past or present, who would it be? Tea and Triscuits with Elliott Smith, I guess. You travel back in time 10 years and meet yourself, doing whatever you were doing musically at the time. What do you tell yourself? Probably nothing. Clearly whatever I knew at the time was enough for me to do what I want to do. What are you plans for your visit to Philly, besides playing the gig? It’s gonna be a quick turn around but I’ll grab a vegan bearclaw or three at Dottie’s if I can.